Known for its clear, insightful analytical narrative and balanced approach, America’s History, Concise Edition is a brief, affordable text that brings America’s diverse past to life. 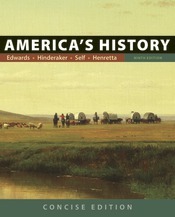 The Concise Edition features the full narrative of the parent text, select images and maps, built-in primary sources and skills-based pedagogy that gives students practice in thinking historically. Enhanced with a wealth of digital content in LaunchPad, the ninth edition provides easily assignable options for instructors and novel ways for students to master the content. Integrated with LearningCurve's, an adaptive online resource that helps students retain the material and come to class prepared.